Welcome to On The Gas. My name is Jason Adamson and I will be looking after your cerebral consumption for the next few paragraphs. Originally from Australia I now live in Japan where my infatuation with raw fish is fed with – raw fish. I have a Masters in Communication and am also currently studying a Masters in Gastronomy with Le Cordon Bleu (the educational institute as opposed to the fried crumbed piece of meat that oozes cheese). I worked for 10 years in hospitality on both sides of the pass, have scrubbed pots, made cocktails, slung beer, crafted coffees, worked the line and decentered wine. I know how to use a knife but would call myself a cook as opposed to a chef. 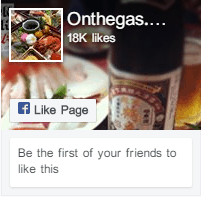 This website ‘On The Gas’ has been created as a place to have virtual BBQs and for you to get e-socially stuffed sideways on the jazz that the world of gastronomy has to offer. Here at On The Gas we are a loose organization of like-minded loose individuals all set to talk about everything gastronomical. We tear apart the world of food and drink in an act of mass mastication like you have never seen before. Not only do we feed the beast that is the Internet … but also fatten, slice and serve it to you on a steel rod. All of our contributors are verified, regulated, accredited and highly acclaimed loose individuals – who think they know their stuff. Many of them are from various corners of the globe, working and living, in mostly other corners of the globe. The pictures are real and most of the names are too. What you see on this website you (hopefully) will not find anywhere else. We are always looking for contributors and have been known to reward those who are ‘worthy’ with enough funds for a bottle of granny’s dancing juice. So if you like to keep it fresh – frisbee us some stuff and we will take it from there. So I hope you enjoy the Gastro-nautical tour that is onthegas.org and if you feel hard done by because you thought this website was going to be about doing hits of Nitrous Oxide – I apologise – here is a video of a hamster making a sign out of cabbage to ease your disappointment. ALSO OF INTEREST – JASON ADAMSON INTERVIEWED BY MATTHEW ROBINSON.